If you read Anvil as a Conspirator variant the Silver gaining of Tools seems more like a liability than an asset, i.e. Tools is an overpriced sifter that you mainly want to enable Anvils. I think the split pile is fine although Anvil could be too good at $4. Tools/Anvil - A bit too tired at the moment to comment in detail, but my first thought is that Anvil really should give some sort of utility without having played a Tools card. If a player misses out on getting a Tools, there is no incentive (ignoring a few interactions with other Kingdom cards) to get an Anvil. It just ends up being a cantrip. Certainly you want to reward players that made the effort to get Tools, but it should still give a little something to those who didn't. Avanto is quite bad and overpriced without Sauna, but it still gives +3 Cards if needed. Yes, I do need to change Anvil. Should have a new version up by tomorrow. (1) This condition is way too easy to satisfy. Since you still get +2 Coffers off a tie with other players, everyone is almost guaranteed (minus terrible shuffle luck) to have +4 Coffers (+2 Coffers from the on-play and +2 Coffers from the next turn) by their 2nd reshuffle. Now that it is a terminal, Duration Action, in Kingdoms without Village support you may only ever be able to get one of these out at once, two if you're lucky or you have a thin enough deck. 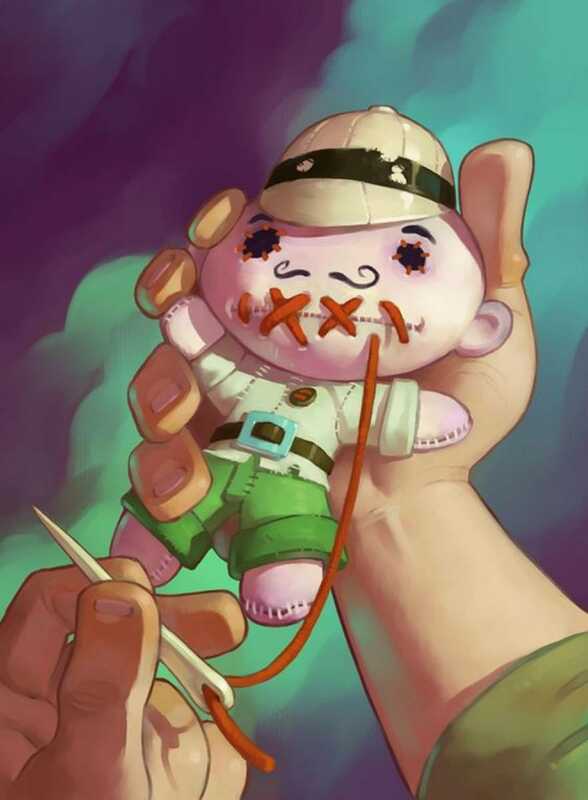 In any of these cases, it will be quite hard to have more Puppets in play then your opponent and thus Puppets will always be a super-powered Merchant Ship. (2) Since having the most Puppets is the only condition for +2 Coffers, players will be at a huge disadvantage if they lose the split or are unfortunate enough to player 3 in a three player game. I'm not sure how, but I think this needs to count other conditions, like type, number of types, cost, etc. Of course now this has to become "Each other player may reveal more <condition> cards from their hand then you have in play. If any player doesn't,..." Or something like that. To fix this you could make it so you have to have more than your opponent to get the bonus, but then you may never get it. Or you could make this a non-terminal Action so they can be stacked. Whatever you decide, I'd just caution against any explosively good bonuses for pulling this off. It sure seems fun, but I think it could make for swingy games. A good card with a small reward is less flashy, but I think it will lead to more fun and fairer games. Just my opinion though. Thanks for sharing these cards! There are so many now! Pub - Of this would be so much fun if you could top-deck multiple times per turn! If people can't keep track of their hands that's their problem! Is there a way to reword Puppets so you only get the bonus once, not once per Puppets? Would that help? Also for Anvil, what about adding +1 Coffers to the top and giving you +1 Coffers for having a tool in play, and make it cost $5. I'm sure there is some kind of "if this is the first time" wording that would work. I'm assuming you're talking once per turn. This would be my suggestion. I'm not sure if it's balanced, but it will only proc once per turn. If you have more Puppets in play then each other player for the first time this turn, +2 Coffers. Now and at the start of your next turn, +1 Buy. Now and at the start of your next turn: if you have more Puppets in play than the player to your left, +2 Coffers. Now and at the start of your next turn: if no other players has more Puppets in play than you, +2 Coffers. Thanks, I think I'll use the first one (for now, anyways). Seaside is one of the three sets I don't have; knew this would happen sometime. Edit: Also, I don't really have a good image right now. If I can't find a better one, I'll have to use that creepy thing. Now Anvil is a Peddler that can give you an extra coin, is that good enough, or should I make it coffers instead? It just seemed better to do this. Tools/Anvil - When Anvil collides with Tools for +1 Card, +1 Action and +$2 Coin, that is certainly a very good card. I think that would be around a $7 or $7.5 cost if it gave that effect unconditionally. I can't say if this is balanced, but $5 with a required collision seems like a fair place to start testing it. To me the real question seems to be how strong is Tools? Can you just run through the Tools pile without pause to get to the Anvils? Will they clog up your hand or not provide enough utility to punish players who rush them? I'd recommend making Tools cost $4 Coin and further possibly removing the sifting if it provided too much utility early. I feel the objective for the player should be figuring out how to best manage getting through the Tools pile to get to the real prize the Anvil pile. The $4 price point is a much higher opportunity cost than $3 and now that Tools can proc Silver gaining off other Tools, players who mindlessly try and pile out the Tools will more likely clog their decks with Silvers, making Tools/Anvil collisions less likely. At least this is what I hypothesize. Also, in games with three or more players, you wanna give every player a fair chance to grab a Tools. Cost $3 can make that tricky with only 5 copies. A straight cantrip that can gain Silvers has a lot of good uses outside of empowering your Anvils. They can be extremely powerful with good trashing and of course other cards that like Silvers. Puppets - This is not an image of puppets, but maybe it can work? It's got the creepy factor! Been almost a week since I added anything, here's Anvil/Tools 2.0. Now Tool is an Heirloom that gives a Villager, and playing both Anvil and Tool in the same turn lets you trash a card. Also, in light of Canal, I'm going to take down Drawbridge. And for Hideout, trying to find a good name, maybe Den, or Hideaway? Thoughts? I like Anvil/Tools, especially Tools; it seems like it is one of the stronger Heirlooms, but is balanced since you only have one (barring Treasurer shenanigans). Anvil should say Tools. And for Hideout, trying to find a good name, maybe Den, or Hideaway? Thoughts? I prefer Hideaway; lots of people colloquially refer to Den of Sin as Den. Or you could consider something like Lair or Sanctum. Actually I meant to have Tools be Tool, thanks for reminding me. I've decided to use Hideaway for now. I agree. There is only one tool ever worth using and that's Ducktape. I like this except for the Villager-cantrip part. Sure, it is a nice buff that can be situationally useful and it is not a big thing to play the card and say that you immediately spend the Villager to keep play smooth but it feels nonetheless a bit weird (in the same way +1 Card +1 Coin would feel weird because there is no terminal that draws only one card). Fairy grove is interesting. I’ve played boons online and there have been times. Where I’m like man I wish I had gotten that boon. I know sacred grove let’s you receive it too. But fairy grove also let’s you skip a boon if you don’t want it. Craft men’s village is basically like farming village, except stronger. Same cost too. With farming village you could still end up getting a copper. With craftsmen village you only get the good stuff. And with a possibility of gaining a silver or ect. Field is nice. Gives you a benefit if you have to discard a good card. Gives you a benefit if your the first one to trash it. Trashing it gives you a benefit. And if your the last one to trash this card, you could end up with the most victory tokens perhaps. Thanks for the comments. I forgot about Farming Village when making Craftsmen Village. I'll have to think about how to change it. Well, it's been quite a while since I've added anything here. Here's one idea I've been working on. I've been trying to come up with another Knight-style pile. I wanted to make two different main cards: an Attack and a Reaction, five of each in the pile. Here's what I have for the attack: Each other player discards down to three cards in hand. If any player didn't, +1 Coffers. For my Reaction, When another player plays an Attack card, you may reveal this to choose one: Draw up to six cards in hand, or be unaffected by it. I don't quite know how that will work. Ideally I would want it to be that if you have two of these in your hand you reveal one to be unaffected, then another to draw up to six. Tracking is not really an issue since they will all be different. As far as the extra bonuses, I will use most of the Knights, but not Vander, Josephine, Martin, and Micheal. 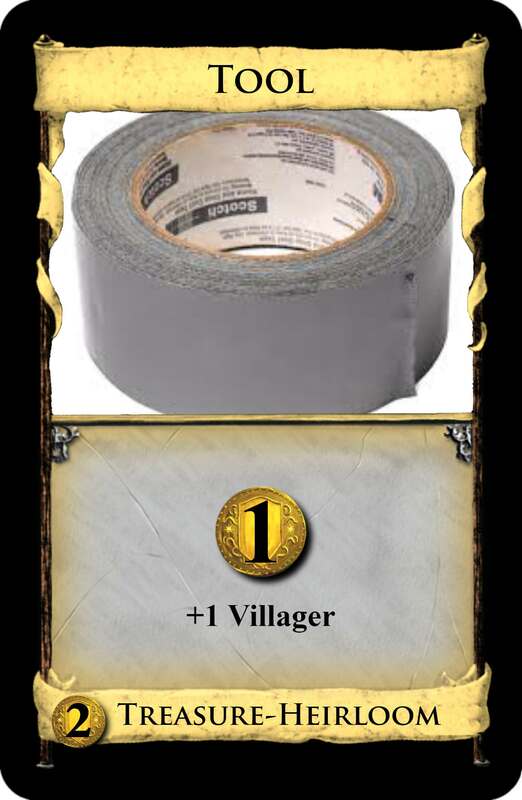 Here are my ideas to use instead: +1 Buy +1 Coffers; you may discard a card for +2 Villagers, Receive the next Boon; Each other player receives the next Hex. I don't think it really matters which things are attacks or reactions. As far as name/theme, I was going to make the Attacks have the Weapon type, and be Sword, Longbow, Lance, Mace, and Flail. The reactions would then be Armor, being Shield, Helmet, Breastplate, Gauntlets, and Chain Mail. Since there are ten different cards to make, I thought I would get some feedback before making mockups. In order to get only one of the two Reactions I think you'd have to make it a discard instead of a reveal. Otherwise, you could always reveal for both options. I get what game play you're trying to introduce, but unfortunately I don't think it can work with how Reaction cards work. I think your only chance would be to put in some text that explicitly overrides the general game rules for Reactions, but that could get wordy. As for the style I like kit a lot, but I worry how this will actually execute in a game. The Attacks and Reactions being mixed together might work, but it seems a bit wonky to me. Knights are an Attack and in a way a Reaction itself to the Attack so it kind of works in a way. The random distribution of this might mean you end up with all Reactions on the top and then it just seems like a dead pile. Even if they are distributed evenly, the Attacks and Reactions kind of just cancel each other so players will just be left with subpar on-play effects. I really like the overall flavor of this I just wonder if there is a better way to execute it other than mimicking what the Knights pile does. Maybe having a non-Supply pile for all the Weapons and Armor then having a pile of 10 same named cards that give you a choice of performing some kind of Attack or gaining a weapon from the Weapon pile or Armor from the Armor pile. Personally I'd do away with the Armor and just make some of the Weapon cards also have a Reaction component. Some real life weapons have more defensive capabilities anyways. Either way this would remove the randomness of the pile. Cool idea though! I just recommend steering away from having all the Attacks and Reactions mixed together randomly. Like Kudasai I like the general idea of a Knights-like pile and I think that it is thematically pretty cool. But I think that the Reaction is too good. With the discard attack you will always choose the Moat option and if there is some other Attack in the Kingdom you can choose the Horse Traders-ish option. Note that the way it is currently designed you could also reveal the same card for both options; there is no way for the opponent to check how many Reactions you have in your hand. So my suggestion is to fix this Reaction accountability issue and nerf the Reactions via setting it aside, like with Horse Traders.